All the holiday decorations have been packed away for a little while now (no more bright red or pink ornaments and hearts for another year) and there's some time before pulling out the Easter decorations - so what to do in between? Do you have special decorations that aren't part of any holiday? A collection of bottles? Or tin toys? Or???? Why nests? With a name like 'Robin' you either hate it and do your best to avoid it, or you embrace it and run with it. Once I outgrew those school days of nicknames, I learned to embrace my name as a part of my favorite time of the year - Spring. And I LOVE decorating for the warmer months. I tend to lean toward more muted earthy tones - browns, soft yellow, robin's egg blue (of course) cream, rustic-white. . . bird nests fit into this aesthetic beautifully! Some of my nests are real, some look real, some are just fun. . . and a few you have to use your imagination! I wasn't in the mood for candles on the dining room table - so how about 'nest'ling some ceramic birds in those candle rings? That's one of my favorite things to do - use candle pillars to show off special trinkets - like nests! Rest one on top, or even at the base of one showing off a little bird figurine. How sweet is that? And what better use for a three-tiered cake/snack plate than to display some fun little glasses and dishes with. . . . nests! As nests don't weigh but a few ounces and are sometimes quite small, I like to tuck them everywhere. In a section of a vintage divided drawer used as a focal point on my favorite display cabinet in my studio. . .
And this great trio of footed cupcake plates topped with rusty chicken wire 'bell jars' (would that be 'wire cages'? Maybe.) protecting the nests and porcelain robin eggs underneath. 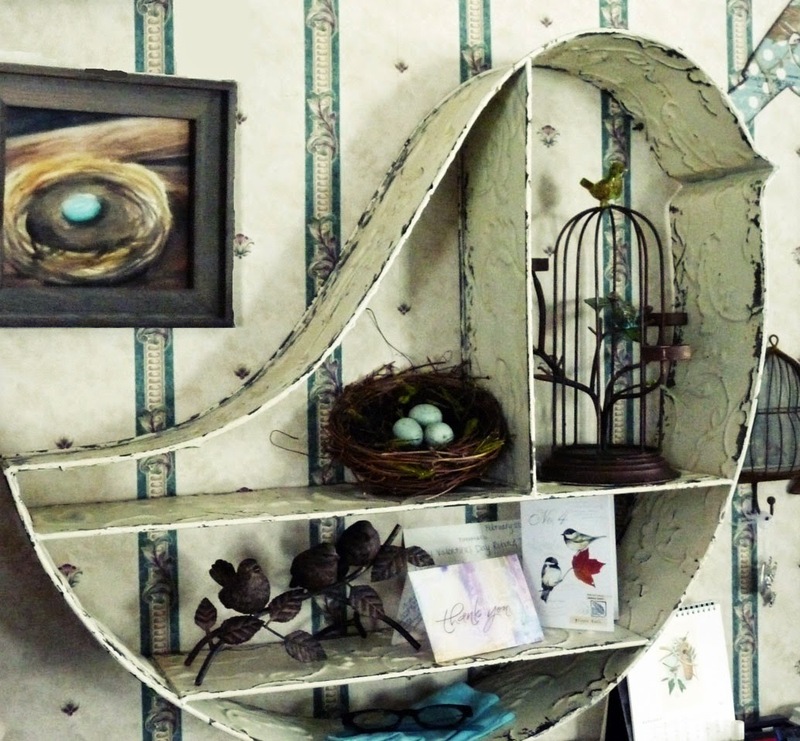 Here's a nest tucked into a corner on my fabulous tin bird shelf (and don't you L-O-V-E the nest painting by my talented dear daughter!) above my desk. And in the entry way - another display cabinet with a row of jars, each showing off a single nest of all sizes and shapes. I LOVE these jars and how they can make something seem that much more special. Of course, you may or may not expect to see a nest in a bird cage. but pretty sure you're not expecting to see one attached to the wall. . . .
complete with an apothecary jar containing unhatched eggs. Many of my other real nests are tucked around on the covered porches. . . pretty sure the birds think my place is a birdie condo! In case you are wondering - I only 'harvest' nests in the fall after the birds have left and before the winds begin causing havoc. I spray them with an insecticide, then spray with water and let sit in the sun to dry well for a day or two. Before bringing them inside, I do also spray them with 2-3 coats of a matte finish clear spray paint. It helps keep them together and gives them a natural 'fresh' patina. Tell me about your collections and share photos of your nesting decorating!! One of these days I'll show you my growing collection of bird cages. Wonderful and creative decorating ideas!